Who likes Bounty Bars? Well I do and I did not have any so I decided that I would make some. They do not need baking and do not take long to make at all. Mix the condensed milk with the coconut until you get a thick sticky paste! The kids will love this bit! 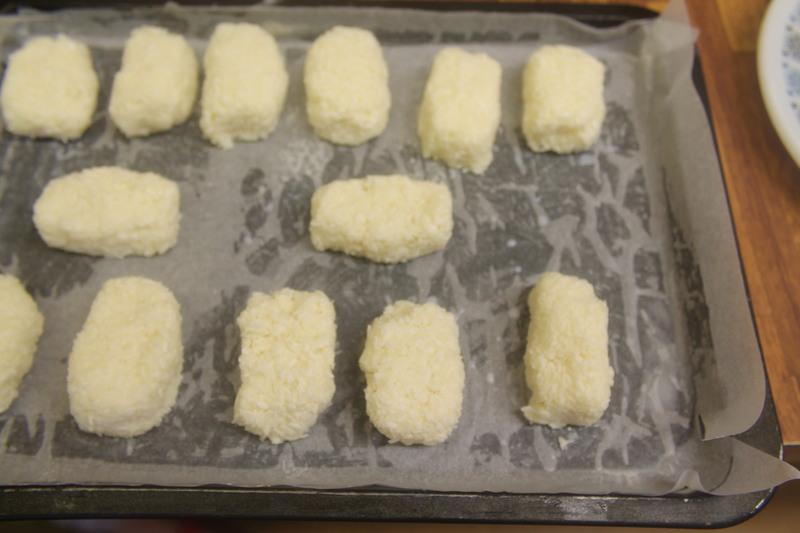 Then using wet hands squeeze and shape into logs and place on the baking sheet. This amount should make about 12. Put the whole thing in the freezer for about 20 minutes, this makes them easier to handle when covering with chocolate. 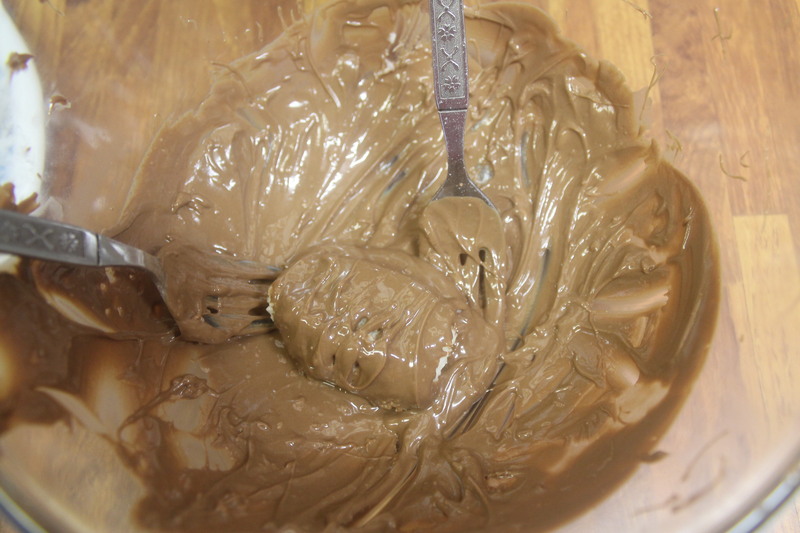 Melt about two thirds of the chocolate either in the microwave or in a bowl over a pan of hot water and stir well. Remove from the heat and stir in the last third (if it is still there!) of chocolate and keep stirring. By adding the chocolate gradually you can get a better shine on the bars. Remove the bars from the freezer and using two forks place the bars one at a time into the melted chocolate and cover the whole bar. 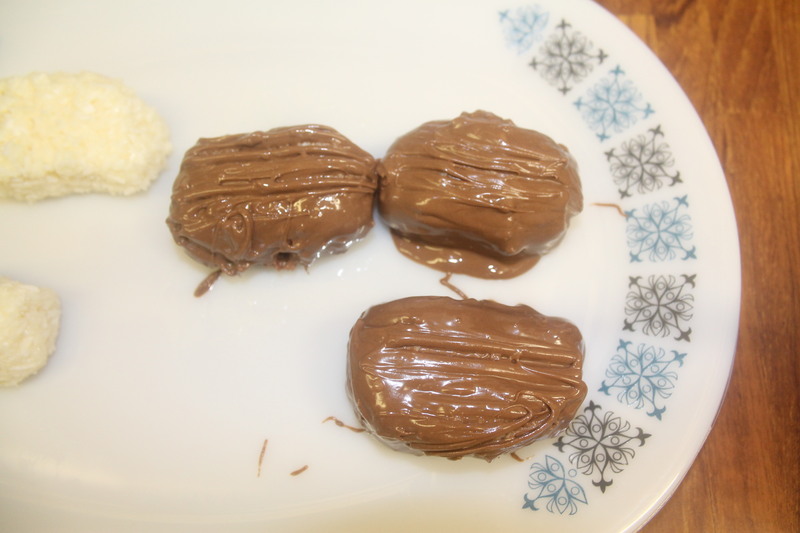 Use one fork to lift out a bar and the other fork to remove the excess chocolate. Place the covered bar back on the baking parchment, do not put on a plate and leave it, I only put them on a plate to take a photo, if you leave them on a plate they will just stick to it! Allow the bars to set for a couple of hours and then store in an air tight tin for up to five days but not in the ‘fridge because they dry out too quickly. Five days you say, they will not last five minutes!! Mine have all gone now but they were very moreish!